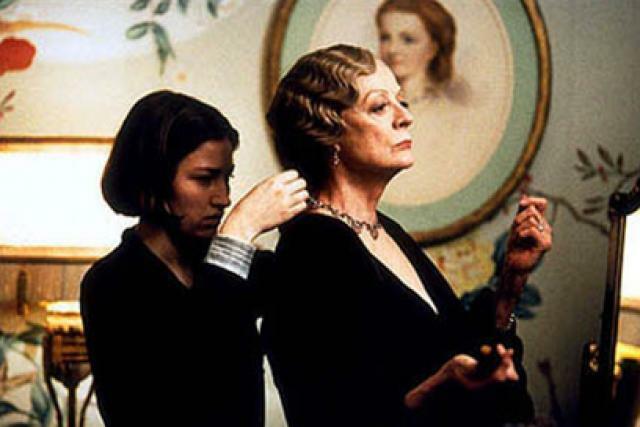 In Gosford Park, director Robert Altman packs up his bag of tricks and heads across the pond for the first time in his career. Utilizing the techniques he’s famous for, including multiple storylines, overlapping dialogue and a huge ensemble cast, he’s created an old-fashioned whodunit, only in this case, we witness everything from the servants’ perspective. And what a lot of servants there are. A weekend hunting trip has brought fourteen aristocrats and their twenty-nine assorted valets, maids, footmen and chauffeurs to the country estate of Sir William McCordle (Michael Gambon) and his wife, Lady Sylvia (Kristin Scott Thomas). Intrigue sets in immediately as snippets of dialogue reveal complex entanglements between both the snobs above the stairs and their employees below. There’s more lust, deception and blackmail going on here than on an entire season of Melrose Place, albeit carried out in a much more genteel manner. As with most of his films, Altman spends a great deal of time examining interpersonal relationships, particularly the strange dependency of the enormously wealthy on a class they deem inferior. True to form, the story unfolds at an unhurried pace, affording viewers ample opportunity to study the tangled dynamics leading up to an inevitable homicide. Thereafter, an onscreen game of “Clue” ensues. Who perpetrated the horrific crime? Was it the Countess of Trentham (Maggie Smith) in the parlor? The lovelorn housemaid Elsie (Emily Watson) in the library? Did hunky matinee idol Ivor Novello (Jeremy Northam) do it with a candlestick, or perhaps sneaky footman George (Richard E. Grant) with a rope? With this many servants on hand, the question isn’t did the butler do it, but which one. One caveat: the overlapping dialogue presents a challenge at the onset thanks to an assortment of conflicting accents. The film’s distributor provided reviewers with six pages of character explanations to help in deciphering the intricate plot. Without this aid, viewers eventually muddle through, and the rewards are definitely great. Just be sure to pay careful attention as things get going, and you’ll be fine once the film hits its stride.